If you are in the Kenai Peninsula area of Alaska for the first weekend in August, you owe it to yourself to check out Salmonfest. 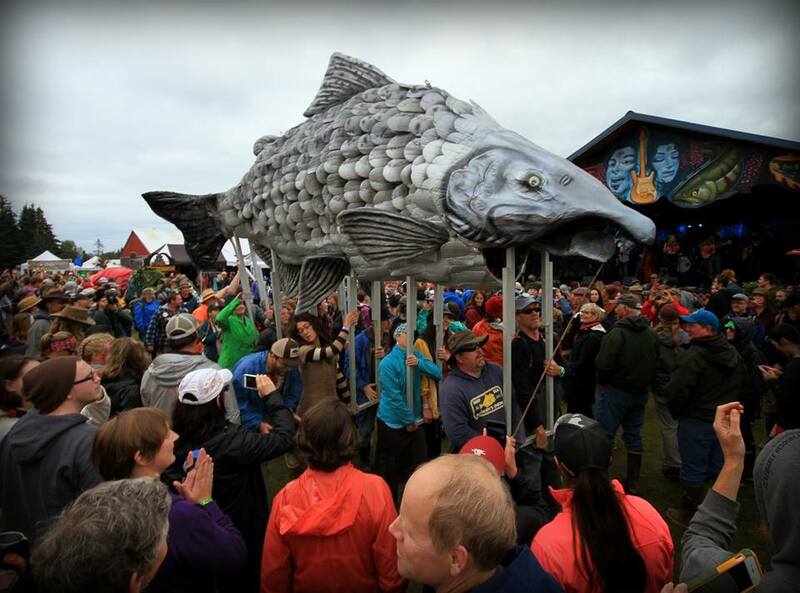 Salmonfest is a 3-day celebration of Fish, Love, and Music at the Kenai Peninsula Fairgrounds in Ninilchik with the goal of bringing together the best of Alaska and Alaskans around one of the state’s most iconic symbols: the salmon. Jim’s passion and energy for the Salmonfest have only grown since the festival began in 2010 (where it was initially called Salmonstock). The event is timed around the local fishing season to allow the fishermen to attend. Today’s festival has a multitude of moving parts that bring together musicians, some of the best food Alaska can offer, education, art projects, children’s activities, made-in-Alaska crafts and goods, and philanthropic outlets. Crowd parades featuring giant fish puppets with names like King Sam and Big Red swim their way through the festival-goers. Jim works to keep the festival “integrated, but individual” so that guests can be as involved in whatever aspects of the festival they choose, without feeling forced into any aspect of offered activity. Over 50 acts will perform on four stages under the Alaskan summer sky. The festival offers a wide variety of music from reggae to bluegrass to rock. Most bands will play at least twice, giving spectators a greater opportunity to experience them. About half of the bands have Alaskan roots, and the festival draws nationally known bands. A few past participants include Emmylou Harris, Jewel, The Indigo Girls, Trampled by Turtles, Rusted Root, Hope Social Club, California Honeydrops, Clinton Fearon, and Tim Easton. The 2018 lineup is headlined by Brandi Carlile and Michael Franti & Spearhead. 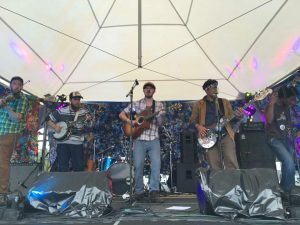 Salmonfest gives back to the community with over $100,000 donated to benefit the Kachemak Bay Conservation Society, Cook Inletkeeper, and Musicians United for Bristol Bay. Additionally, the festival is working to be a zero waste event, with volunteers on hand to help educate people about recycling, composting, and reducing human impacts on the environment. After the festival, composted waste is returned to the Ninilchik community to use in their gardens. Ninilchik, whose name translates to “peaceful settlement by a river,” is a picturesque native village on the west side of the Kenai Peninsula, about 45 miles from Homer (3 ½ hours south of Anchorage). The village has strong Russian influences and many people still speak an old Russian dialect mixed with ancestral Alutiiq and Aleut. Ninilchik is centrally located and offers full amenities including several campgrounds, lodging, restaurants, and shopping. During the summer months, many fishing charter services are available from Ninilchik. Depending on the season, you can catch halibut, Dolly Varden, and all five varieties of Alaskan salmon. To accommodate the festival crowds, Salmonfest offers a free shuttle service for that weekend between the Fairgrounds and the various campgrounds. The shuttle runs about every 30 minutes and makes a convenient way to get around while avoiding some of the festival traffic congestion. For information on the festival, campground options, and shuttle service, visit their website or the Salmonfest Facebook page. Also, check out the nearby Ninilchik State Recreation Area.